For Cape Ann in the Antarctic, see Cape Ann (Enderby Land). Not to be confused with Cape Anne. 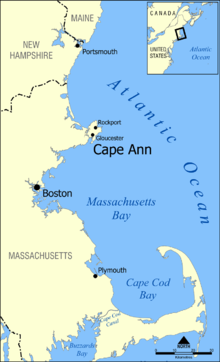 Cape Ann is a rocky cape in northeastern Massachusetts, United States on the Atlantic Ocean. It is about 30 miles northeast of Boston and marks the northern limit of Massachusetts Bay. Cape Ann includes the city of Gloucester and the towns of Essex, Manchester-by-the-Sea and Rockport. May 2008 aerial view of Cape Ann in Massachusetts. Gloucester and its harbor are visible to the right. Cape Ann was first mapped by the explorer John Smith. He had given it the name Cape Tragabigzanda, after his mistress in Istanbul. He had been taken as a prisoner of war and enslaved in the Ottoman Empire. His mistress had fallen in love with him, but Smith later escaped in Russia. When Smith presented his map to Charles I, he suggested that Charles should feel free to change any of the "barbarous names" (meaning the many Native American place names he had adopted) into English ones. The king made many such changes, but only four survive today. One was Cape Ann, which Charles named in honor of his mother Anne of Denmark. The English colony at Cape Ann was first founded in 1623. It was the fourth colonizing effort in New England after Popham Colony, Plymouth Colony and Nantasket Beach. Two ships of the Dorchester Company brought 32 in number with John Tylly and Thomas Gardner as overseers of a fishing operation and the plantation, respectively. This colony predated Massachusetts Bay charter and colony. For that reason, members of the colony were referred to as "old planters". The first Great House in New England was built on Cape Ann by the planters. This house was dismantled on the orders of John Endecott in 1628 and moved to Salem to serve as his "governor's" house. When Higginson arrived in Salem, he wrote that "we found a faire house newly built for the Governor" which was remarkable for being two stories high. By 1634 the name of Cape Ann was already established, as it is mentioned and depicted on maps in William Wood's New England's Prospect first published in that year. By the mid-1800s, Cape Ann was known for its specialization in granite production, specifically in creating paving blocks for roads and streets and were used across the United States from New York to San Francisco. 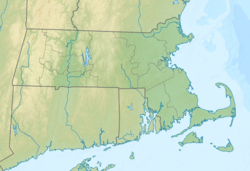 The entirety of Cape Ann lies within Essex County. Anchored by the city of Gloucester, the nexus of the local fishing industry, other towns on Cape Ann include Rockport, at the tip of the cape, and the towns of Essex and Manchester-by-the-Sea, which are located where Cape Ann joins the mainland. At the end of Cape Ann, and splitting Gloucester into two parts, is the Annisquam River. Many locals who live in Gloucester and Rockport refer to the land east of the Annisquam as "The Island". There is a waning but still persistent sense of independence that exists among some of those living there who are from old families that they rarely, or never, "cross over the bridge" since everything they need is on the island. The island has its own schools, water supply (by quarries) and its own hospital, the Addison Gilbert Hospital. Cape Ann is the location of the fictional town of Sea Harbor, the setting of the Seaside Knitters mysteries by author Sally Goldenbaum. Sea Harbor is on the coast, with Gloucester as its nearest neighbor town. Cape Ann is also featured as the setting for the Harry Chapin song "Dogtown," which is also the name for an abandoned town on the Cape. The fictional "Gloucester Island" in 1966 Cold War comedy film The Russians Are Coming, the Russians Are Coming is located off Cape Ann and was named for the city of Gloucester. The book Slaughterhouse Five mentions Cape Ann as the honeymoon location for the main character Billy Pilgrim. Based on actual events in 1991. Setting out for the one last catch that will make up for a lackluster fishing season, Captain Billy Tyne (George Clooney) pushes his boat the Andrea Gail out to the waters of the Flemish Cap off Nova Scotia. Cape Ann is also the location of main character's home in the book Trouble. Cape Ann is the title of the fifth and final section of T. S. Eliot's poem, "Landscapes," which lists the coastal birds of the region. Additionally, the title of his poem The Dry Salvages refers to a cluster of rocks "off the N.E. coast of Cape Ann, Massachusetts." The fictional town of Paradise, setting of the Jesse Stone novels, is near Cape Ann, which is briefly mentioned in Night and Day. ^ Stewart, George R. (1967) . Names on the Land: A Historical Account of Place-Naming in the United States (Sentry edition (3rd) ed.). Houghton Mifflin. p. 38. ^ Rasmus Andersen. "The Church of Denmark and the Anglican Communion". Project Canterbury. Retrieved 7 November 2015. ^ Goff, John (2009). Salem's Witch House: A Touchstone to Antiquity. History Press. ISBN 978-1-59629-519-3. ^ St. Germain, Paul. Images of America: Cape Ann Granite. Arcadia Publishing, Charleston. 2015. ^ Martin, Roger (1997). Rockport Remembered: An Oral History. The Curious Traveler Press. ^ Eliot, T. S. The Complete Poems and Plays: 1909-1950. New York: Harcourt, Brace, & World, Inc., 1971. pp. 95. ^ Parker, James (2012-10-14). "A pilgrimage to T.S. Eliot's Dry Salvages". The Boston Globe. Retrieved 2015-10-15.